Although we've seen sporadic, often vague, media reports of avian flu activity coming out of Iraq since 2005, last April's OIE Notification Of Multiple H5N1 Outbreaks In Iraq, was the first official acknowledgment of H5N1 in that country we'd seen in nearly a decade. 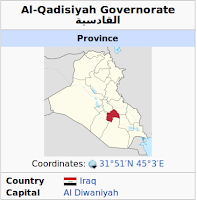 The matter was officially closed on May 5th when Iraq filed a final report with the OIE listing 6 outbreaks which occurred between December 2015 and February of this year. But Arabic media reports of newer, large poultry die offs continued to come in, such as this report picked up by Sharon Sanders of FluTrackers last April. Last week FluTrackers picked up reports of large poultry die offs in Kirkuk - attributed to infectious bronchitis (a common malady of poultry) - and in late June Tetano posted Iraq: Media report: 200 thousand chickens culled in the district towns due to H5N1 bird flu. Despite no official reports from the Iraqi government since April, these reports would suggest Iraq's avian flu problem is far from contained. Over the past 24 hours Iraqi media has carried multiple reports indicating that - in order to bring avian flu under control - one province is taking the dramatic step of ordering a halt of all poultry production for a period of three months. 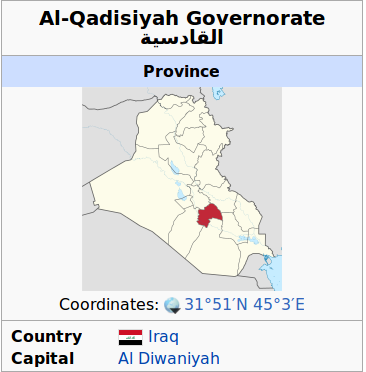 The location provided (`the province of Diwaniyah') is a bit confusing, since Al Diwaniyah is actually the capital of what is now Al-Qādisiyyah Governorate, but parts of which were once called ad-Diwāniyah Governorate. Cultivation of the province of Diwaniyah Director Safaa al-Janabi announced a decision by the Minister of Agriculture to stop breeding and production of chicken meat in all poultry farms in the province for a period of three months, attributing the cause to Avlonza control of bird flu and who needs this time to eliminate it. He said al-Janabi told Radio tow that poultry production will return again after three months from the date of implementation of this resolution, which was to begin its implementation during the current month, in addition to the rest of the provinces of Diwaniyah. This report doesn't specify the type of avian flu, although HPAI H5 seems likely given the region's history. Hopefully we'll get an OIE reports clarifying matters.